In July 2000, people under the age of 18 established an international organization dedicated to achieving a permanent Culture of Peace brought about with the assistance of Child Participation. They named their organization the Young General Assembly to illustrate their dedication to the United Nations goals of building a peaceful world. The organization is managed by an Executive Committee of people under the age of 18, a Finance Committee of people over the age of 18 and a Special Issue Committee made up of people both under and over 18. There are 91 Member Organizations in 57 countries involving over 2 1/2 million young people worldwide. In 2001 the Young General Assembly side event at United Nations headquarters in New York, the participants produced a fifty-question survey that NGOs can take to assess how effectively they are using Child Participation to build a Culture of Peace. This survey was widely distributed, but no NGO ever returned the results to the Young General Assembly Secretariat. The hardest obstacle to overcome is the attitude that people under 18 are not capable of making decisions or initiating responsible action towards building a Culture of Peace. This attitude has made it extremely difficult for children and adolescents to get the attention of government and United Nations officials so the young people can form effective partnerships. After the Young General Assembly was awarded ECOSOC and UNICEF special consultative status this became a little easier if an adult made the initial contact and then the children were brought into picture. The attitude that children and adolescents are irresponsible has definitely hampered funding. Grant giving foundations do not want to donate to an organization run by children, even though people over the age of 18 manage the organization's financial and legal matters. What they cannot seem to understand is that the children are more careful with money than adults. People do not seem to understand what Child Participation is. The Young General Assembly has worked hard to educate people about Child Participation and to have people understand that without Child Participation, there will be no permanent Culture of Peace. What is most disturbing is that official representatives, chosen by their peers, under the age of 18 from an organization that has DPI NGO status and ECOSOC and UNICEF special consultative status cannot get an annual pass to carry out the organization's work at United Nations headquarters. The Young General Assembly has established Hear the Children Day of Peace to be observed worldwide on September 21st, the International Day of Peace. On this day adults and children are to meet, discuss community needs and plan how they can work together to establish a local Culture of Peace. During the years 2001-2005, at annual Young General Assembly sessions in Swaziland, Romania, Nigeria and online, the young people designed and distributed 160 project plans so other young people, at low cost, could bring their local communities into a quality of life that could become a permanent culture of peace. The project plans were in the areas of health (including HIV/AIDS and stopping hunger), education, environment, child rights and stopping every form of child abuse. Young General Assembly representatives presented side events at the PrepComs for the United Nations General Assembly Special Session on Children, at the Special Session itself, at workshops at Annual DPI/NGO Conferences and at the World Summit for Sustainable Development in Johannesburg to educate people on the value and possibilities of Child Participation in building a Culture of Peace and achieving the Millennium Development Goals. In 2002, the EARTH Contest was held online and produced 30 environmental project plans for young people to do. From November 2003-August 2004, the Young General Assembly conducted the Olympic Truce Letter Campaign. Young people urged their government officials to revive and observe the Olympic Truce. At present the Young General Assembly is looking for funds to publish the 105 project plans written at the 2004 Annual Young General Assembly Session in Nigeria. These plans were designed to help young people help achieve the 21 targets of A World Fit for Children, to fully implement the Convention on the Rights of the Child and the Millennium Development Goals- all of which the Young General Assembly views as being means to establish a permanent Culture of Peace. 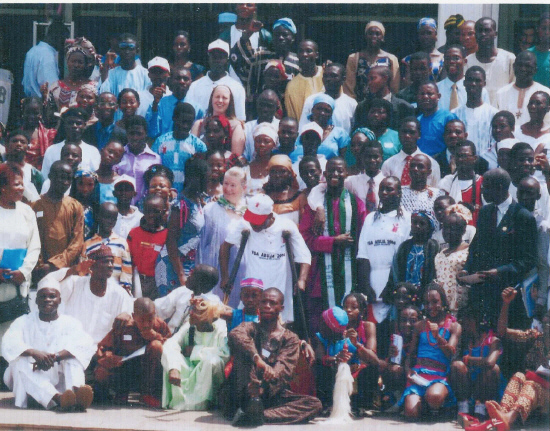 2004 Young General Assembly participants in Abuja, Nigeria where the young people wrote 105 project plans to build a permanent culture of peace. The Young General Assembly strongly recommends that the Secretary General immediately take steps to ensure that people between the ages of 15 and 17 representing organizations that have ECOSOC special consultative status are allowed to obtain annual passes to United Nations headquarters so they can carry on the organization's business. The Young General Assembly strongly urges the General Assembly to establish an Advisory Committee to the General Assembly on Children's Affairs that is made up of people under the age of 18. Each United Nations member state mission should be responsible for having one male and one female come twice a year to New York to participate in the Advisory Committee meetings at which the delegates would discuss issues they would like to see taken up by the General Assembly and render written statements to the General Assembly committees and President about matters at hand involving children. Children know their issues best and can help the General Assembly come up with low-cost, effective solutions. The Young General Assembly is a network of 91 Member Organizations. It has worked with UNICEF, the United Nations Department of Public Information, the Food and Agriculture Organization of the United Nations, United Nations Environmental Programme and Save the Children. Peaceways-Young General Assembly intends to continue to work hard to get Child Participation recognized as a vital element in the building of a permanent Culture of Peace by having international meetings, sending out bulletins, initiating workshops to educate and inspire action and having under 18 representatives attend United Nations meetings. The organization hopes to widen its distribution of the project plans already written and those that are yet to be written. It also hopes to qualify for affiliation with UNESCO.